Introduced in 1998. 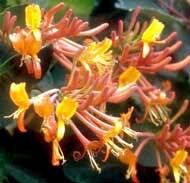 This vigorous deciduous vine boasts 7 cm long tubular flowers in May and June then periodically throughout the summer. Foliage is an attractive copper color in spring before maturing to deep green in summer. Propagation is prohibited without license. Royalty of $.20 per plant will be added to invoice.